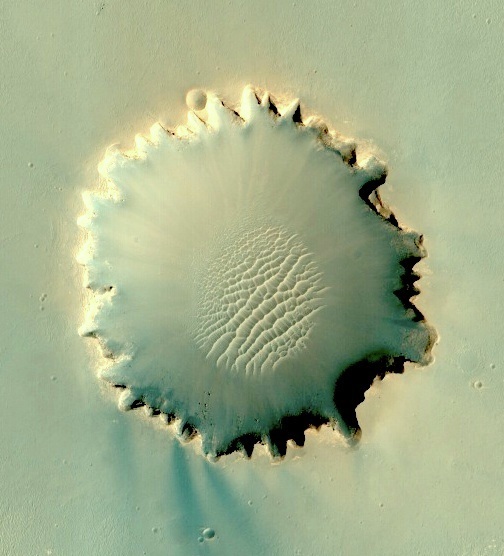 This is an image of Victoria Crater. At the very beginning of the piece the rhythm you hear is the actual MIDI data that is derived from the image and applied to a drum kit. It only required a slight adjustment to achieve the desired effect. Then, after this introduction, I use different synthesizers to adjust the sound and feeling of that same data. At times I directly adjusted the data for a specific musical reason, but for the most part I kept the data unedited. The end result is that there is an audible stream of image data running throughout the piece. 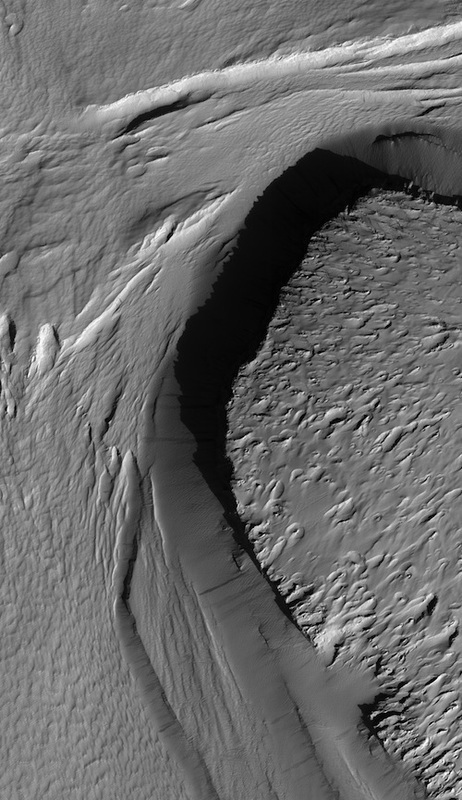 Moses says this image is "from a place called Russell Crater that has a bunch of dunes on which gullies form. These dunes change throughout the season, with lots of carbon-dioxide coating the surface in the winter and then moving around in spring and summer, forming the gullies." In order to try something different, and also because Moses expressed an interest in using stringed instruments, I wrote this as a string quartet. It helps that string quartet also happens to be one of my favorite ensembles. The music generated from this picture was particularly chaotic.The title was suggested to me by Moses and I went with it, using the meaning of the word as much as inspiration as I did the strings of notes that he sent to me. An unconformity is the geological feature that is found here in the image, having to do with two different strata that eroded differently over time. I chose solo piano for this piece because I enjoyed the way the chords felt under my hands as I developed them. Also the piano has a tremendous range that is so frequently not taken advantage of, and I wanted to write a piece that dealt with these extremes. I chose to return to a electronic medium for this composition because I hadn't done one that way in a while and I really enjoy it. I've also been so busy performing on acoustic instruments lately, it's fun to explore sounds that are impossible to make without a synthesizer. My wife says that she can hear the writhing of snakes in the music. Although I didn't consciously intend to create that particular effect, I'm pleased that it came out that way. That's a great thing about art; it takes on a meaning of its own apart from its creator. Here's what Moses says about this image:"This is part of the Medusae Fossae deposit, which is still a bit of a mystery. It extends a great distance (1,000+ km). RADAR observations suggest that it's volcanic ash, as do some other observations. This is an area that's called a stealth-zone because RADAR doesn't return a very strong signal, indicating high isotropic scattering of the RADAR beam, so very little of it returns to the instrument. The material, whatever it is, is quite young, easily erodible, and very interesting." I chose 80s heavy metal as the musical idiom for this piece. Except for the opening, all of the guitar parts are derived from the raw data of the image. I added a few special touches of my own (ie. the pick slide--one of my favorite additions). You'll also hear some eerie sounds in there that is the raw data pumped through various synths. It isn't exactly authentic to the genre, but I liked the way it fit in there regardless. 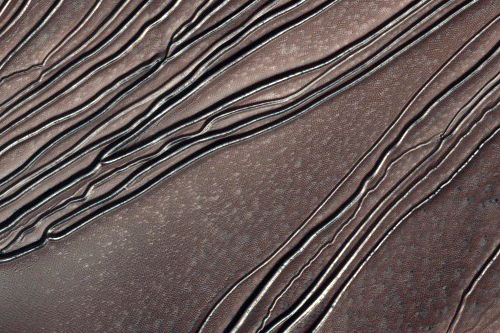 Moses says, "Reticulate dunes are one of the commonest dune types, but are relatively poorly understood. 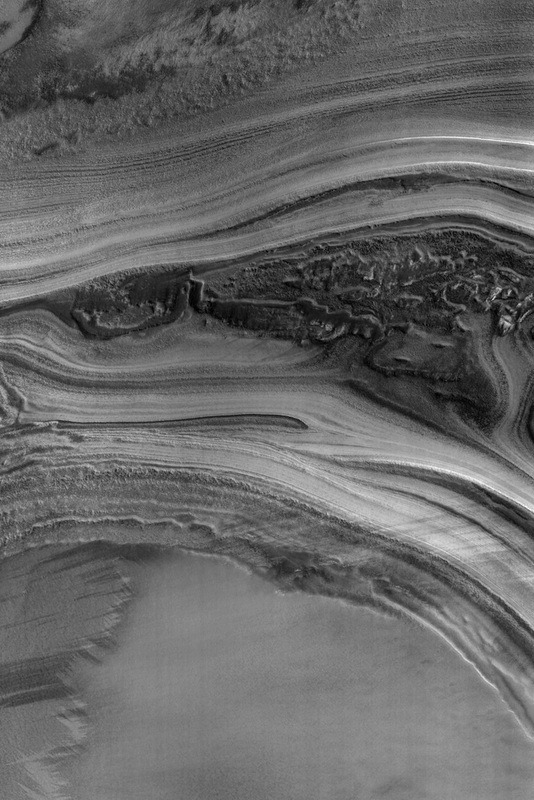 At present the best tested hypothesis for their formation is that the primary ridges are formed by dominant winds in one direction, while the secondary ridges are formed through subdominant winds in the perpendicular directions. That is, there are two major wind directions acting at once, though one is obviously stronger (and more constant) than the other."